as a fully-functional pneumatic spear gun. Nemo fires his rifle to protect Ned and Conseil from an attacking shark. In Verne’s book, the weapon fired an “electric bullet” comprised of a glass sphere carrying a charge. 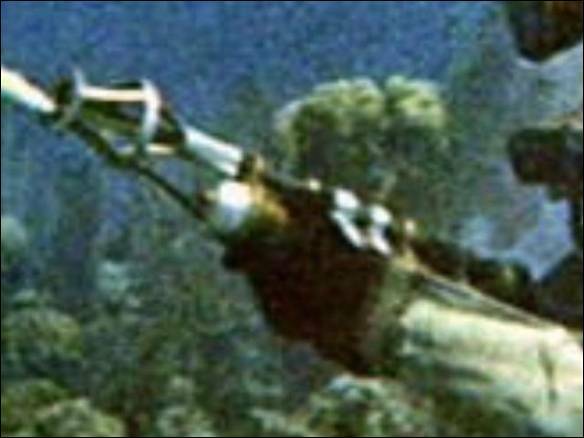 In Disney’s movie, the prop rifle fired a burst of air bubbles, and the red streak was added to the film later by animation. Larry Brooks suggested I duplicate the effect by combining a burst of bubbles with the beam from a red laser pointer; that’s a great idea and we may make that modification in the future; but first, in keeping with our other Leagues items, we decided to make our rifle fully functional. Since we don’t have any “electric bullets” laying around, we decided to go with a pneumatic system that fires a spear. We chose to build our rifle according to the published Disney plans, AMAP. We tried to stay as close to the specs as possible, but also tried to match what we see in the movie. For instance, the plans call for an open peep site above the trigger. That doesn’t show on some the movie props we’ve seen; and at any rate, a diver could never get his helmet behind such a site to take aim. So we did without it. We might add it on later, though. Here’s a replica prop gun from Bob Burns’ collection: made of metal, fiberglass, and the like. It has the peep site we spoke of. There were several variants used in the movie. Notice that this one has a longer black “pistol grip” than what shows in the plans. Also, the spheres aft of the barrel are black on this gun, while on the plans they are specified as being brass. “What’s right?”, you might ask. Actually, both types are seen in the movie. Here’s a picture of the workbench aboard the dive barge in the Bahamas back in ’54 while the guns were being serviced. 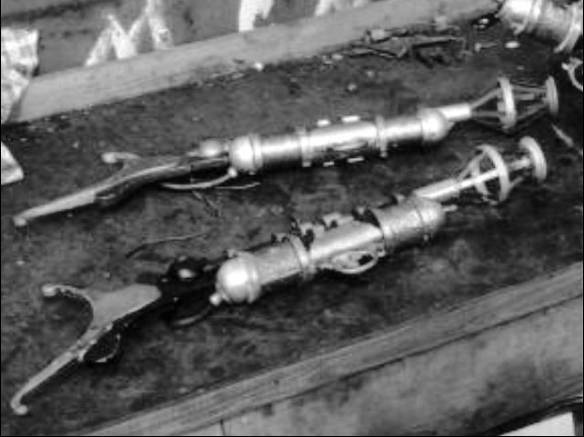 Notice the lower rifle has the larger pistol grip, and the spheres are black. The upper rifle has a smaller pistol grip and brass colored spheres, like what’s specified in the plans. We chose to go with the latter design, as much as possible. But what did Nemo use to dispatch the shark? If you look closely, you can see that the spheres on the gun he actually fired were brass colored, not black. So, that’s another reason we went with brass. As an interesting factoid: notice that the air bubbles did not come directly out of the barrel; but rather, from a small black tube that seems to extend up from the air tank to the front of the muzzle cage. This might have been done to put a thin, concentrated stream of bubbles right where they wanted it. The work begins. 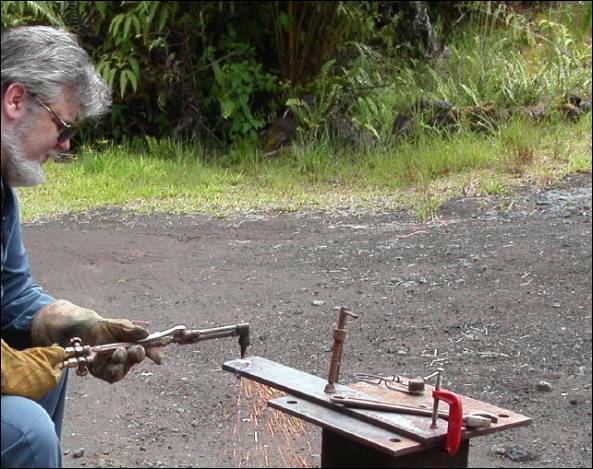 Here, I’m using the oxy-acetylene torch to cut steel to produce the basic stock assembly. This will then be shaped by hand, to serve as the foundation on which all the other parts will be assembled. When it came to the air tank, the plans called for “hammered copper”. We could have simply taken a piece of tubing and painted it copper-colored. 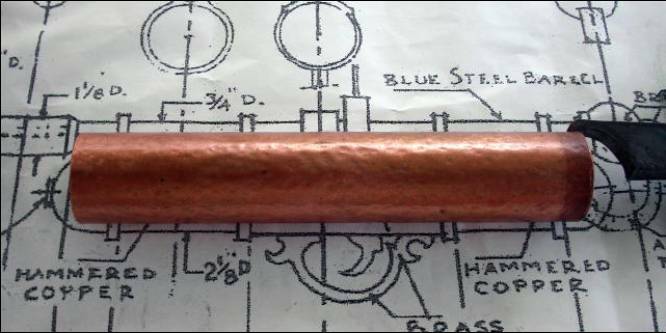 But instead, we made our tube out of what the plans called for: hammered copper sheet, rolled into the correct shape. In this view we see the nearly completed rifle, minus the tubing from the tank to the sphere, hanging on our model display case. Where the plans call for brass, we have brass. Where copper is specified, that’s what we used. The little “N” on the stock was carved by hand from 1/8” brass plate. The aluminum hemispheres on either end of the tank were sand cast from wooden plugs made for this project. The front hemisphere comes off, allowing a handmade high-pressure tank to be placed inside the copper tube. 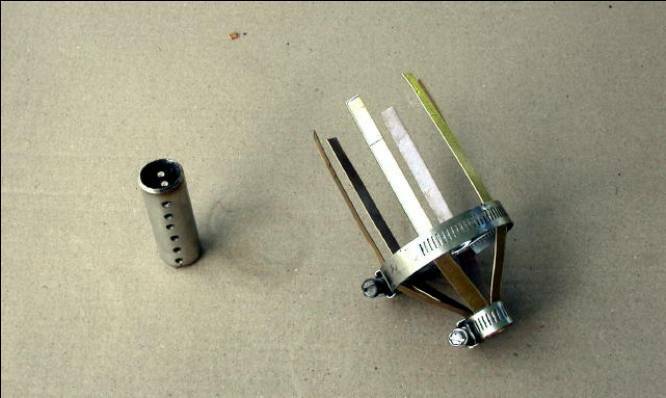 That’s what will provide power to fire the spear, which can be tipped with a point for hunting, or with any of a number of commercially-made power heads for protection against dangerous underwater predators. Here’s the rifle with external detailing completed as far as we intend to go with it at this time. On most replicas I’ve seen, the tube running from the aft end of the air tank to the brass sphere is a simple black rubber hose. On the plans, “flex metal” tubing is called for; and I’ve seen that on at least one gun I know was an actual prop; so that’s what we used. The plans say the frame and pistol grip are supposed to be gunmetal blue like the barrel. (The flash makes the blue stand out a little extreme in this picture, BTW.) But because all the other props I’ve seen had the frame painted black, that’s how I did mine. I may change it in the future, or might leave it the way it is. 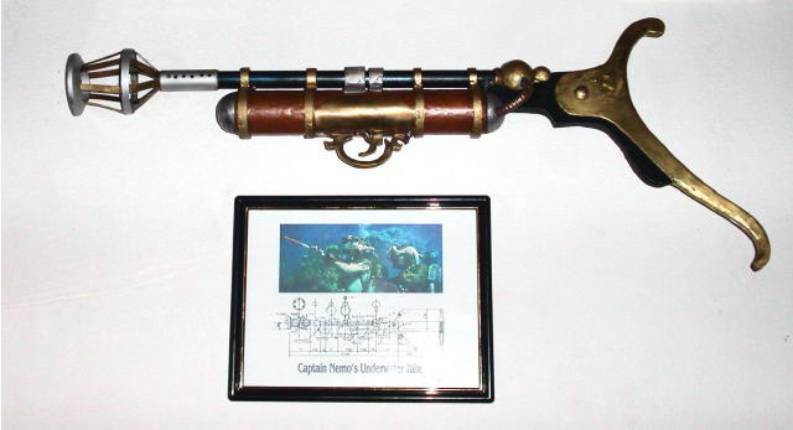 Captain Nemo’s Underwater Rifle mounted as a display. A night shot of the rifle with a spear in the barrel.